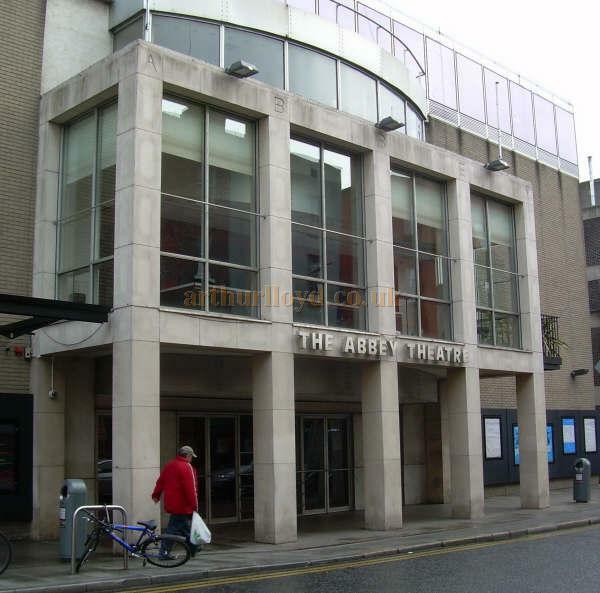 There have been two Abbey Theatres in Dublin, the first originally opened in an earlier building on Marlborough Street on the 27th of December 1904. This building was destroyed by fire on the 18th of July 1951. The second and present Abbey Theatre opened on Monday the 18th of July 1966. 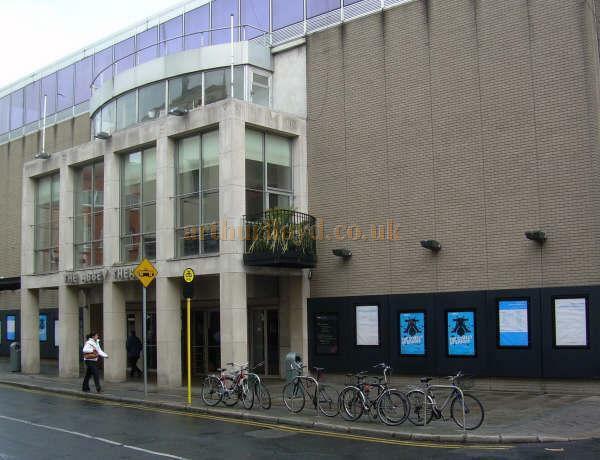 The Theatre is home to the Abbey Theatre Company, also known as the National Theatre of Ireland, and was the first state subsidised Theatre Company in the English speaking world. 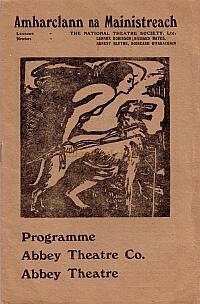 Right - A Programme for 'Friends and Relations' at the original Abbey Theatre Dublin - 18th September 1950. This first Abbey Theatre was built partly by reconstructing the auditorium of an old Music Hall called the Hibernian Theatre of Varieties situated in Lower Abbey Street, and by utilising space from the Hibernian's adjacent building; the Mechanics Institute, and also another empty building in Marlborough Street just around the corner which was to be used as the new Theatre's Foyer. 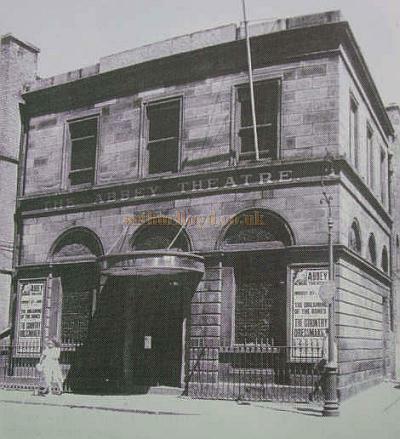 The main entrance to the new Theatre was to be on Marlborough Street but an exit from the back of the auditorium to Lower Abbey Street was installed where the original Hibernian's main entrance had been. The Abbey Theatre opened on the 27th of December 1904 and had a proscenium opening of twenty one feet and a depth of just sixteen feet, although the stage itself was forty foot wide so it did have some wing space. To get from one side of the stage to the other without being seen however, meant that actors had to use a small alley outside and behind the Theatre. From 1925 onwards the Irish Government gave the Abbey a state subsidy and it became the first Theatre in the English-speaking world to be subsidised. 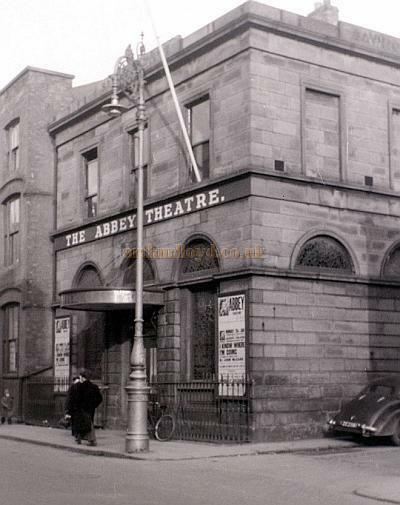 Left - The original Abbey Theatre, Dublin on the 31st of January 1959 - Courtesy Allan Hailstone. On the 18th of July 1951 the Theatre was destroyed by fire and the company was made homeless. However, almost immediately the Guinness Brewery came to their rescue and they re-opened in the Rupert Guinness Hall in James Street on the outskirts of the city centre. After a short period of time the Queens Theatre in Pearse Street was closed and the Abbey Theatre Company then transferred to the Queens. The death of one theatrical company had helped another company to survive. There is much information on the Abbey Theatre buildings and history here. You may also be interested in visiting the Abbey Theatre's own Website here. The Foundation stone for the present Abbey Theatre building was laid on the 3rd of September 1963 and the Theatre, designed by the architect Michael Scott, opened on Monday the 18th of July 1966. The building is located next to the Liffey river and was built on a floating concrete raft. The Theatre consists of two auditoria, the first is the main Abbey Theatre with a fan shaped auditorium which can be adjusted in height to accommodate Concerts or Theatrical performances, and has a capacity of 492. The forstage has two lifts which can be lowered to form an orchestra pit, or extended forward by fourteen feet to make a more intimate space. The second is the Peacock Theatre, details below. Above - The Peacock Theatre, Dublin in March 2009 - Courtesy Des Kerins. 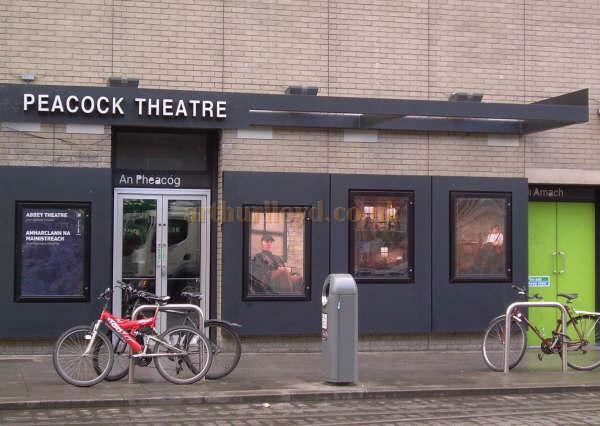 Below the Foyer of the main Abbey Theatre is a smaller Studio Theatre called the Peacock Theatre, this has a capacity of 127 and can be used in the traditional manor or with a stage surrounded on three sides by seating. The Peacock is dedicated to the presentation of new plays and contemporary classic drama. Some of the textual information and images on this page were kindly sent in by Des Kerins.